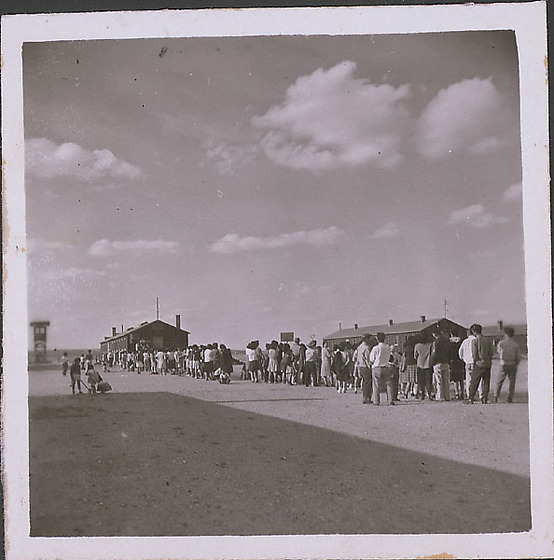 Large crowd of people standing in line waiting for the opening of the Block 28 movie house at Heart Mountain concentration camp, Wyoming, May 1944. 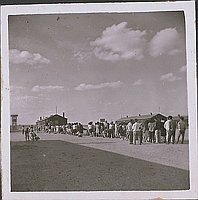 The line extends from the foreground right to a barracks in the distance, left. There is a guard tower on the far left. Another barracks visible behind crowd at right. Fluffy clouds above. The cost was about 20 cents and a giant single ice cream cone was 5 cents at the Heart Mountain movie house.